This Dart 16J16 16 oz. white foam cup is ideal for coffee, soft drinks, shakes, juice, tea, or water. It features a one-piece molded construction, distinctive pedestal, and space-saving design. This cup's foam construction provides excellent insulation, making it great for maintaining the temperature of your customers' favorite hot or cold beverages. Whether you're stocking your disposable drinkware supply in your cafe, kiosk, hotel, or other venue offering drinks on-the-go, this Dart cup is the economical choice that gives you functionality, durability, quality and satisfaction! We want to do customizable cups so we ordered these in try them first and they are really good. Quality is great and what I would expect from a Dart product. Those Dart foam cups are exactly as advertised. This is a very light big box and it arrived undamaged from the shipper which is a big plus. These foam cups are very sturdy and not at all flimsy like the ones we previously used and were looking to replace. I love the convenience of them coming stacked in a roll of 25. Makes it so much easier to store and inventory. 16oz white foam cups are great for any occasion. It can hold hot or cold drinks, I use it personally for a shop that I have. Much more reasonable price for the same quantity, size and brand of product that we’ve preferred in the past. Shipping was fast and very reasonable. This is a great Styrofoam Cup that holds up real well in extreme heat, while microwaving the liquid contents for thirty seconds in the microwave oven. Plus , Dart is a very well known name brand!!! The 16 oz size is a great size for a cup on the go! These a perfect inexpensive cups that we have used for our fountain soda, juice, milk, hot cocoa, coffee, and tea needs at our restaurant. A perfect item that keeps cold drinks cold without "sweating" and hot drinks hot. Very sturdy. Very well insulated. Fits nicely with the top. Great buy, fabulous price. Some of the cups were crushed at the bottom is the only reason for the 4 and not 5 stars. Will purchase again. They are wonderful for to go drinks for my customers. They are the perfect size to take along. I like the foam cups because I feel like they keep the drinks colder so much longer. These cups work great for my needs. I don't have any issues with them. Some cups break from being taken out of my cup dispenser, but any foam cup will break if you abuse it. These 16 ounce foam cups are great quality. We were surprised with how sturdy they were and how well they hold up. customers love them because they keep drinks cold longer than plastic cups. Good size cup just didn't like how few came in the package for the price. I find more cups for a cheaper price at retail stores than here. It did last a little bit for us but it went quicker than I wanted it to. For styrofoam these are great. They are very sturdy, even full of hot coffee. The heat from the coffee doesn’t come through the cup too much so they are comfortable to hold without a sleeve which cuts down in costs! This 16 oz dart cup is great for my snow cone business. Quality of product is great. And price is affordable and it's good name brand foam cup. I am satisfied with this product. These white foam cups are perfect for the thirtiest of mouths! A 16 ounce size is perfect for the person who wants to pour the drink and never have to get up again! Nice thick durable cup offered in a quantity that is great for high volume establishments. Great portion size and affordable price makes this a good purchase for your business. This case of twenty-five Dart sixteen ounce White Foam Cups has worked great with our to-go small-medium milkshakes. They can withstand the heavy liquid without worrying it will leak and are disposable so no dishes to clean. I would highly recommend for the great price. Solid and sturdy foam cup for hot or cold drinks. They are one piece so they don't leak. Easy to get lids on and off of and customizable. These 16 ounce foam cups are an economical cup for any bar or restaurant. Paper or recyclable plastic cups are more eco-friendly but if you're looking for a cheap cup, these are good quality. 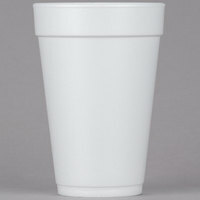 This white foam cup is the 16 ounce size and perfect for soft drinks and other iced beverages. The foam style cup provides an insulation for regulating the temperature of the drinks you are serving and works for both hot and cold beverages. These cups are great to be used with Shaved ice or Sno Cones. I also like that you can put your own logo on them. Well we ordered the 16oz cup because we previously order the 14 oz and we wanted to go bigger. They arrived on time and well packaged. Everyone seemed to be happy about the extra 2 oz. The can easy be wrote on with a permanent marker. I love these cups. They are the perfect size for a large drink order and they fit nicely in cup holders. They stack well and are sold at an affordable price. These are pretty standard cups. They have a good uniform shape to them and the lids fit them well; you can easily cap them with one hand. Good size for smoothies or coffee drinks. These foam cups are great for keeping cold drinks cold longer than the plastic cups the same goes for hot drinks when compared to paper cups. Really love this product. This cup works well with the Dart 16LCDH clear dome lid with a hole. I use it for milk shakes and other thick drinks that require a straw. We use these for drinking cups mainly, but for our to go orders for sides of gravy these work perfectly! Pair them with your standard lid and you're all set. The foam absorbs some of the heat so no burnt hands. These are firm and well made cups. No worries about leakage. Also you can store other items in these cups. Great for Hot or Cold items. I purchased the Dart Solo 16J16 16 oz. White Foam Cup - 25/Pack for home use. The quality is great and the price is very reasonable. Highly recommend! these are such great cups, they really insulate well, cold or hot, nothing stops them from working, the size is perfect without being to big. Nice that these come in small packs if you just need a small amount or are sampling before placing a big order. Nice option for logos too. There are several reasons we choose to use this specific cup. We are able to customize and add our logo or whatever message we choose, they are simple, and very cost efficient, especially by the case. We use these for to-go orders and employees. They are a great value, and a good size. Useful for both hot and cold beverages. Getting 1000 in a case ensures we only need to order them sporadically. Nice product! Great cup at the perfect 16 ounce size. Not too big and not too small. Perfect for a cup of coffee or a nice cold ice tea! The 16oz. Styrofoam cups hold a lot of liquid and the insulation helps keep my coffee hot in the morning. It fits any size cup holder and works every bit as expected with hot and cold drinks alike. I like to use foam cups for parties because guests can write their name on it and cups don't get wasted. These 16 oz cups are great. These are great cups. I use them for all of my catering events. They do not sweat very much and I have not had any complaints about them. They are convienently packaged in 25 piece sleeves. I'm not usually a fan of Styrofoam cups, but these cups were very sturdy. We were very happy with the quality. The cups made it easy for guest to serve themselves at our wedding reception. Used the Dart Solo 16J16 16 oz. White Foam Cup 25 / Pack to hold orange drink. These cups have so many uses. Arrived undamaged. We use these for our milkshakes! Simples and professional looking. Keeps the milkshake cold (holds temperature) sturdy not flimsy quality great price and used to store. Love these as much as I do the 8 oz. styrofoam cups. These are ideal for our fundraiser rootbeer floats or for the every day hot beverage. These cups are such a great price and are well made. We bought some foam cups from a local place and they kept busting when people held them. Loved the fact that Webstaurant Store sells this product in smaller quantity. Perfect thickness & size for our use. It keeps the temperature of the drinks, whether it's hot or cold. Normal sturdiness. These are some really great cups and the customers love them, they keep the sodas cold and they are a common size that fit the cup holders. Dart makes a really good product and Web sells these at a great price. We use these for our "employee cups". They are cheaper than using any of the sizes that we buy for our customers with our logo on it. And there is plenty of room for the employees to write their names on em. perfect for hot liquids, keeps them nice and hot, great prices for the amount of cups you receive. will be ordering these again very soon. These keep cold drinks cold and hot drinks hot. Others said they weren't thick enough, but they'll do just fine for my wedding reception. They are a perfect size and will prevent guests from running back and forth to the drinks for refills. The Dart 16j16 16 oz. White Customizable Foam Cups sold 1000 per case. We use alot of these cups for when customers want a drink to go. They help the drinks keep the same tempature. Work great. This is our 'Regular' size for coffee purchases and in the winter months we can't sell enough of them. These cups are very high quality and come at a very nice price! Decent cups. They are not as thick as I would like, but work. The price is right, so its a good value overall. Will order more soon. I love this cup keeps the frozen lemonade at temperature for longer compared to paper cups. Does not make your hand super cold like the paper cups and i plan to use these now on. The Dart 16 oz. White foam cups are great. We go through several a day with our to go drinks.Usually cokes or sweet tea.The customers love it .They keep drinks cold a long time. These cups are sturdy! The customizable factor makes them easy to advertise your restaurant! Great unique item for small restaurants! Stacks easily! Great affordable price!!!! Good value for a commodity item. Would buy again, as we have not been able to find the same product for a better price. Good. These cups are great, good quality, perfect size for what we need.very good price and larger quantity then what we had previously were getting for the same amount of money. Can't beat the price anywhere. I've been to sams club and they are more expensive there. Even with the shipping. These are our take out beverage cups. I have just switched over to all foam cups for my iced and hot coffee/espresso drinks. My customers like it as it keeps the drinks hot and cold.